I love baby eggplant available once-in-a-while in farmers market. I often try various different combinations to stuff and bake these cute little eggplants (also known as brinjal or aubergines). Few of my most favorite stuffing are curried sweet yellow onions or tomato and cheese. 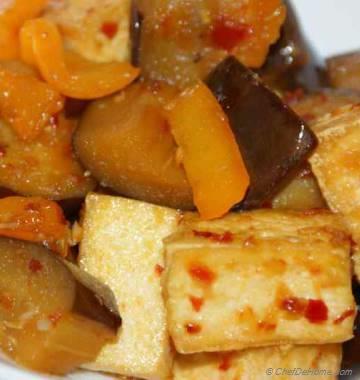 Many people often don't like taste of eggplants. 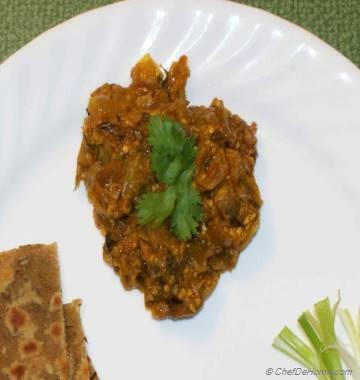 Here is a quick recipe which explodes with flavor and will make any eggplant-hater love it in very first bite. 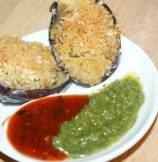 Eggplant are soft and sweet, and baked breadcrumbs and cheese make nice crispy topping. You can also mix some grated cheddar cheese with topping, however I have only used parmesan cheese and panko breadcrumbs for this recipe. Or Eggplant Parmigiana for Appetizer! 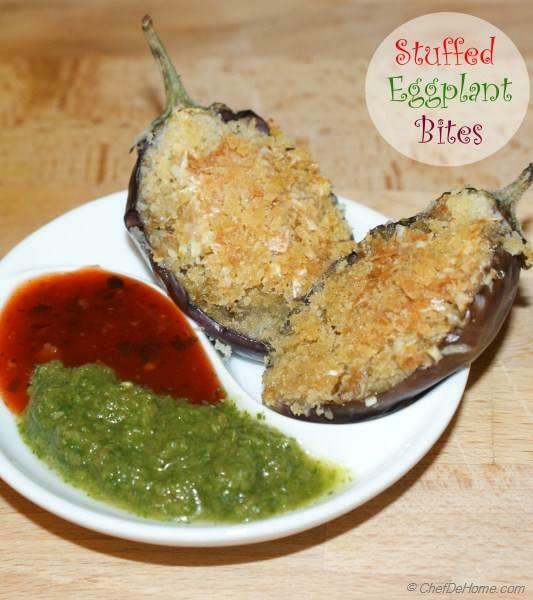 Well, this is yet another delicious way you can serve these eggplant bites! As "Eggplant Parmigiana Bites". 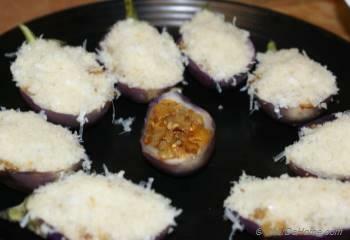 Just top each baby eggplant with some grated mozzarella. No change in recipe instructions, and then instead of ketchup or chutney, serve it with side of warm Marinara Sauce. How good does that sound! 1. Preheat over at 400 degree Fahrenheit. Slice baby eggplants into halves length-wise. 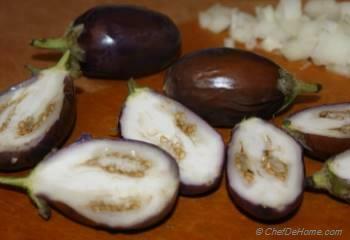 Scoop out the pulp of eggplants with small spoon keeping 1/4 inch pulp still attached to skin. 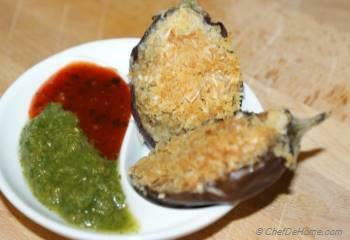 Place eggplant halves in a bowl, toss with 1 tbsp oil and salt per taste (2-3 pinches) and leave aside. 2. In a pan, heat 1 tbsp oil. Add diced onion and eggplant pulp and saute till onions are translucent. Add red pepper flakes, curry powder and continue saute for 2 minutes. Season with salt to taste and remove from heat. 3. 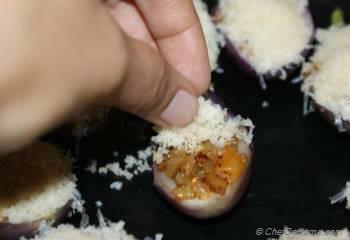 Stuff eggplants halves with the cooked mixture and pack it tight using spoon. Arrange eggplants on baking sheet with stuffed side facing up. 4. Top each with 1/2 to 1 tbsp breadcrumbs and cheese mixture. 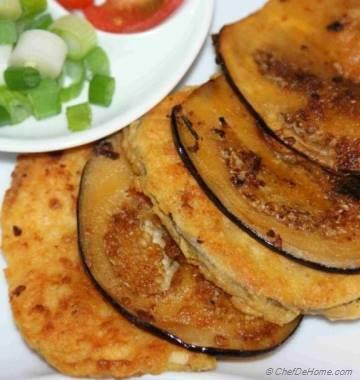 Drizzle with remaining 1 tbsp oil (optional) and bake in preheated oven for 18-22 minutes until eggplants are knife tender and breadcrumbs are brown and crispy. 5. Remove from baking sheet and serve hot with cilantro chutney or tomato ketchup on the side. Or serve with Marinara Sauce for eggplant parmigiana bites! It looks delicious and easy. I&#39;m going to do this recipe tonight! !